Paula Schuler, owner of the Branding Iron Restaurant in Scranton, presented the council a petition with 192 signatures supporting the reappointment of Scranton Police Chief Larry Alexander. 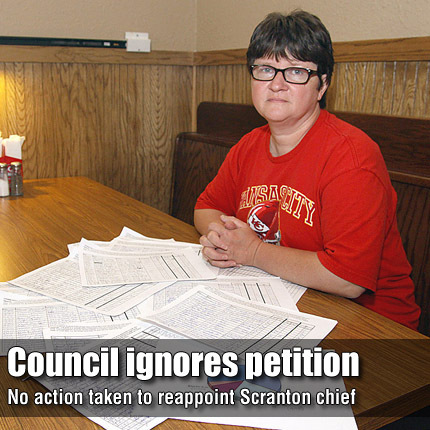 SCRANTON—Branding Iron Restaurant owner Paula Schuler presented a petition to the Scranton City Council July 5, requesting reappointment of Scranton Police Chief Larry Alexander. The council rejected Schuler’s efforts. On May 17, the council rejected Scranton Mayor David Barnes’ reappointment of Alexander. After presenting a petition last week, Schuler reported that 192 people, out of 200 who were contacted, signed the petition. She said three of the 200 did not support reappointment, and five were undecided. A total of 126 people who were contacted identified themselves as registered Scranton voters. Two registered voters did not sign the petition. No registered voters stated that they were undecided.